Ryosuke Yamada (Hey! Say! 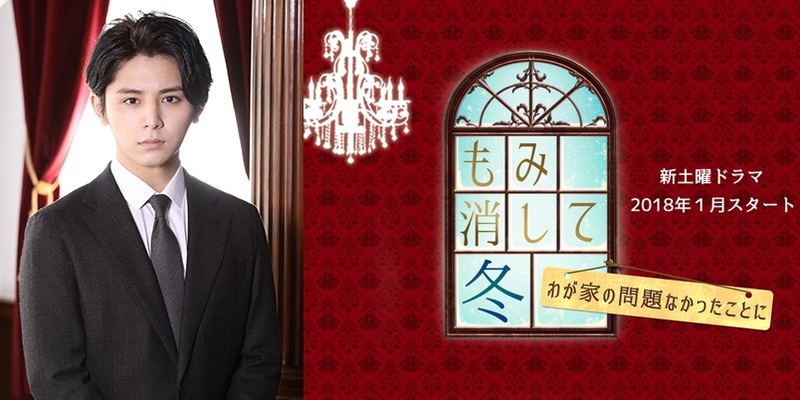 JUMP) will be starring in the upcoming Winter 2018 drama もみ消して冬～わが家の問題なかったことに～ (Momikeshite Fuyu: Wagaya no Mondai Nakatta Koto ni). This NTV drama will begin airing in January of 2018 on Saturdays at 10 pm. Momikeshite Fuyu will be a family comedy following the elite Kitazawa siblings. Yamada will be the lead role of Shusaku Kitazawa, the youngest of the three siblings and a Todai (Tokyo University) graduate policeman. In this drama that portrays a slightly different type of family love, I think how we go about creating this kind of family is very important. I have acted with Haru in the past, but this time she will be playing a different role of a strong older sister so I looking forward to seeing her character. This is my first time acting with Ozawa, but upon meeting, we could see similarities in our faces. Shusaku is the type to hide his emotions and has the lowest position within the family, so I am thinking of various ways to portray this character. I have not acted in a comedy in a long time, so I will tackle this drama seriously while I enjoying myself. I think we will be able to create an enjoyable drama that will make the audience laugh. Chiaki has a very strong sense of justice and will not admit to being wrong so I think people will be surprised by this character. The characters are serious in odd situations so I am a bit worried that I will laugh during the filming. We still do not know how the story of the Kitazawa family will progress so I am looking forward to it. I think that with these three people acting as the Kitazawa siblings and Baijaku as the father, the cast will create an amazing drama. While Hirofumi does love his family, he also loves himself so he is a bit of a shifty character. It will be interesting to see Shusaku be made fun of by Hirofumi and Chiaki. Through the power of the cast and staff, I hope that the Kitazawa family will become the ideal family to be talked about in 2018. I will work hard to create such a drama.